Modern experimentalism with an ambient sensibility. Ensemble 303 (www.ensemble303.com) is an experimental music performance ensemble. Based in Los Angeles, the group formed at the California Institute of the Arts. 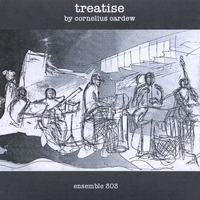 This performance of Cornelius Cardew's graphic score Treatise was recorded live in the Main Gallery of CalArts in Valenica, CA on April 7, 2008.